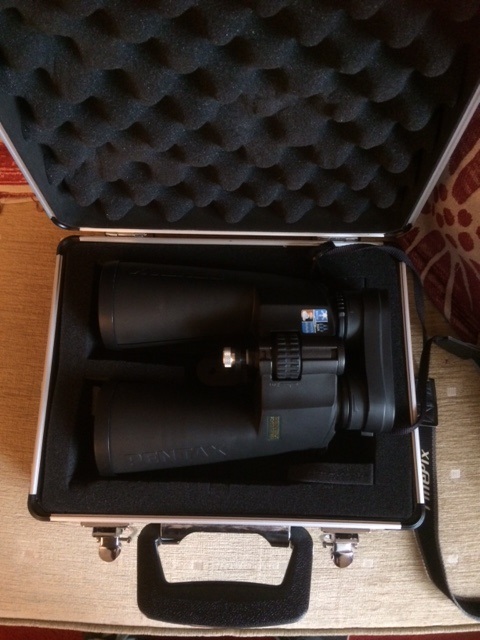 Product Review: The Pentax PCF WP II 20 x 60 Binocular. The achromatic telescope has enjoyed a long and illustrious career in the hands of skilled observers. In my most recent book, Chronicling the Golden Age of Astronomy, I have documented and shared with you the amazing achievements of the classical refractor over three centuries of time. But it would be quite inaccurate to claim that it has been really superceded by anything else in the modern age. This is especially true in the case of binocular manufacture, where sales of achromatic instruments vastly outsell models which possess modern ED glass. And there’s a good reason for this: ED is an expedient luxury that impacts little to the binocular view, what with their low magnifications and wide fields. For every ED model offered, there are a great deal more models made with traditional crown & flint. Consumers vote with their wallets. We still live in the achromatic age. Having enjoyed and appreciated the achromatic refractor for decades, I have come to the conclusion that it is in the binocular that achromatic optics has reached its zenith. Properly made, achromatic optics provide wonderful, sharp and contrasty images of the eartly and heavenly creation. This conclusion has been reached by extensive field experience of a variety of achromatic binoculars that show vanishingly small amounts of secondary spectrum and which are far more alike than different to models with ED glass, but at a fraction of their cost. These sentiments are also reflected in the models still being marketed by some big names in the large binocular world, including Celestron and Oberwerk. What these manufacturers offer is great performance at prices that won’t leave you out in the cold. For certain kinds of visual astronomy, large binoculars simply can’t be beaten. The ability to use two eyes rather than one greatly influences the quality of the views, where it impacts depth of field perception, faint object detection and significant improvements in perceived contrast. Without a shadow of doubt, large binoculars are the single most powerful way to enjoy larger deep sky objects, where telescopes simply cannot offer the same ‘zoomed out views.’ That said, it’s very much a Goldilocks scenario; increase the magnification too much and you lose those gorgeous panoramic sights, but when the power is too low, finer and fainter details remain elusive. It was with this realisation that I took a punt on a curious large achromatic binocular made by Pentax; enter the PCF WP II 20 x 60. That Pentax were prepared to put their name on the PCF WP II 20 x 60 is a lesson in objectivity. Why would such a prestigious manufacturer of high-end cameras and sports optics decide on a well-appointed, large achromatic binocular? The answer is that when well made, even a 20x model would deliver up wonderful, tack sharp views of the landscape by day and breathtaking celestial vistas by night. And this has been achieved at a price point that suits the budgets of discriminating amateur astronomers who just appreciate well designed classical optics; true observers rather than casual sightseers; folk who want real substance rather than the latest ‘gee whiz’ gimmicks. 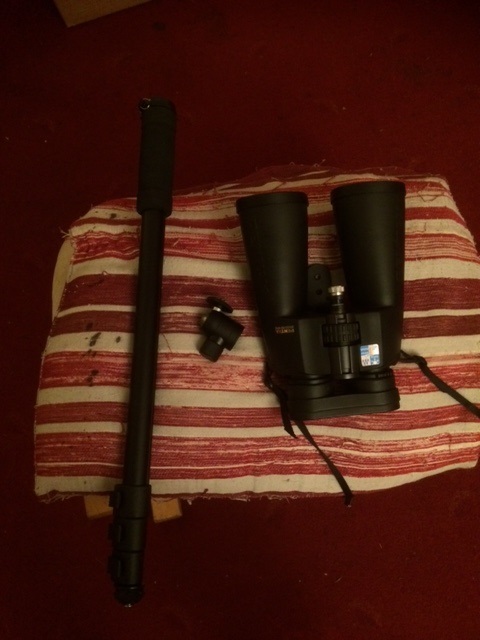 Though the instrument can be acquired at a good, price new (£219 UK for the latest SP model), I was lucky enough to acquire this binocular in excellent, used condition for a little over half the retail price. The former owner had taken very good care of it, added a sturdy carrying strap and dispensed with the flimsy carrying case, replacing it with a sturdy foam-lined aluminium case. The Pentax 20 x 60 snug in its foam-lined aluminium case. Note the tripod adapter attached to the instrument. The porro prism binocular weighs just 1.4 kilos (~3 pounds), surprisingly light for an instrument of these specifications and is water and splash proof. This may account for the WP(water proof?) in their name. The interior is purged with dry nitrogen gas to prevent internal fogging and to minimise corrosion.The body, which is constructed of a lightweight magnesium alloy, is covered with a protective rubberised substrate that is easy to grip and is tough and durable in all weathers. The petax 10 x 60 is deisgned for rough weather use. The optics are fully multi-coated to maximise light transmission to the eye and reducing contrast-robbing internal reflections to a minimum. The beautifully applied multicoatings on the large 60mm objective lenses. Hard coatings on the ocular lenses maximise their durability. The centre focusing wheel is remarkable in two respects. Firstly, it is quite tight in comparison to other binoculars I’ve used. This was intentionally done by the manufacturer, as you’re not likely to use this instrument watching fast moving birds or some such, necessitating the rapid change of focus position. This increased tension does however allow for very precise focusing to be achieved. Secondly, there is a facility on the focuser to lock it in place. Simply push the focusing wheel forward and it is locked in; a nice design feature that can be advantageous. For example, if you end a session with the binocular focused on the stars at infinity, locking the focuser in place ensures that you can re-engage with the sky whenever you’re next out, with minimal (if any) re-focusing necessary. The well designed focuser ensures very accurate focusing of the instrument and can be locked in place simply by pushing the focussing wheel forward, as indicated. 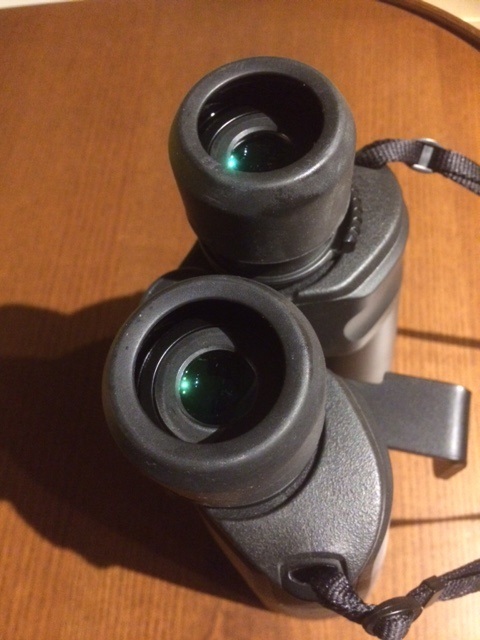 The strong bridge connecting both barrels of the binocular is reassuringly stiff, allowing one to easily obtain the correct inter-pupillary distance (IPD) and only requires occasional adjustment in field use.The dioptre setting is found under the right-hand eyecup allowing independent focusing of both barrels. It has just the right amount of tension and stays in place without any fuss. The dioptre setting on the binocular lies directly under the right eye cup. 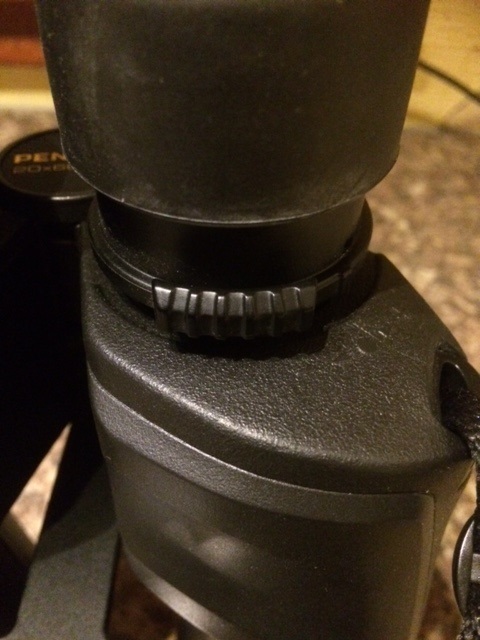 I really like the twist up eyecups on the Pentax PCF WP II 20 x 60. 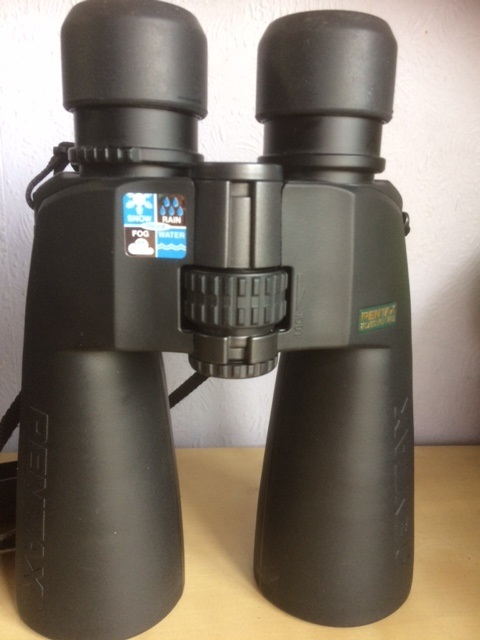 Like my smaller roof prism binoculars, they click into place and are quite secure. Eye glass wearers just need to hold the eyecups down, while those who don’t (yours truly included) can extend them upwards for very comfortable, full-field viewing. The texture of the cup is hard rubber which is a far cry from the cheap fold up/down eyecups seen on many other large binoculars in this price range. Indeed it is my experience that the latter can fragment in prolonged field use, necessitating their replacement from time to time. These sit very comfortably against the eyes and never need to be adjusted. Eye relief is exceptional; a verry comfortable 21mm. High quality hard rubber eye cups twist up and lock in place for non eye glass wearers. Those who wear eye glasses will likely keep them fully down while in use. It is not the weight per se that forces one to mount this binocular. As stated above, they are quite light for their optical specification. Rather, it is the 20x magnification that limits their hand-held use. 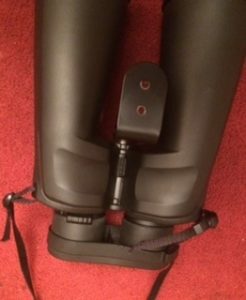 That said, I can hold them reasonably steady by extending my hands a little further forward on the barrels than with my smaller binoculars and this strategy can work quite well for short, ‘quick peek’ sessions. Incidentally, I discovered thumb indentations on the belly of the instrument presumably designed to assist hand holding! Golly gosh! Ain’t that sweet: indentations to fit the hand on these big binos! Still, whatever jitter you have, it will be magnified 20 times while looking through it. Such high powered binos definitely require some kind of stablising action and, in this capacity, one can either elect to use them tripod-mounted or by using a monopod. The Pentax PCF WP II 20 x 60 binocular can be easily mated to a light weight tripod with an appropritae adapter. A word of caution; avoid using those cheap plastic tripod adapters that often attend bargain basement large binos such as the ubiquitous 15 x 70. These introduce an annoying level of flexure that will almost certainly detract from enjoying the instrument in the field. It is strongly advisable to invest that little bit more in a good quality, all-metal unit sold by Opticron and other companies. 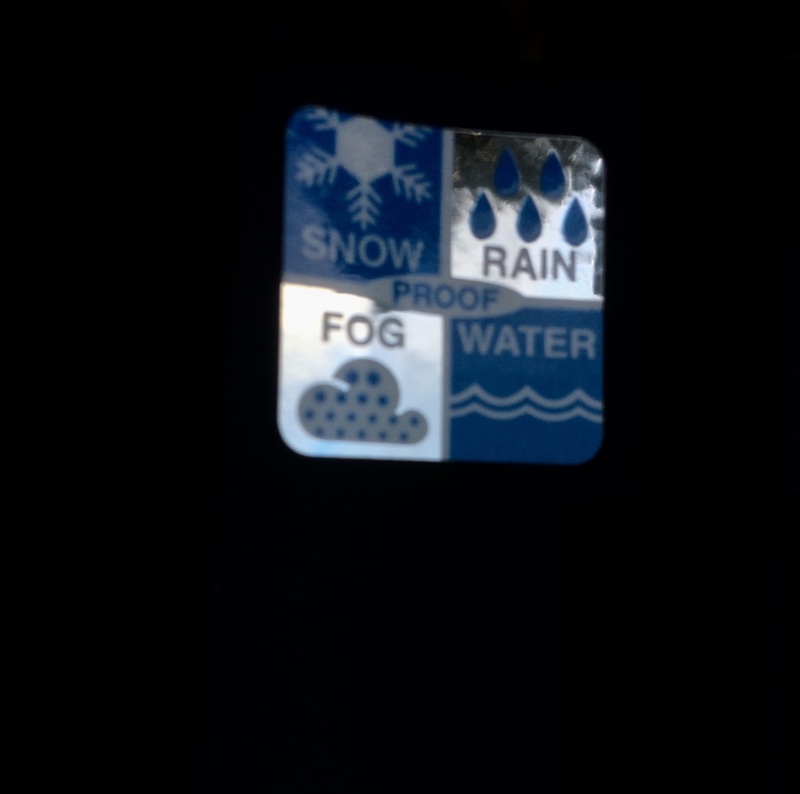 Indeed, I found the same adapter that fits my 10 x 50 roof prism binocular also work swimmingly well with this larger instrument. Tripods have their pros and cons though. Although they offer the maximum level of stability and have built in slow-motion controls on both axes, they are quite uncomfortable to use when aimed high in the sky. I found it quite hard to find a suitably comfortable positioning of my eyes when used in the seated position. That said, a trpod was useful in checking collimation of the barrels and certain daylight activities, but in the end the most suitable way I’ve found to use this instrument is by mounting it on a simple monopod. Using a high quality(solid aluminium) ball & socket adapter, mounting the 20 x 60 on a monopod is quick and easy to execute. 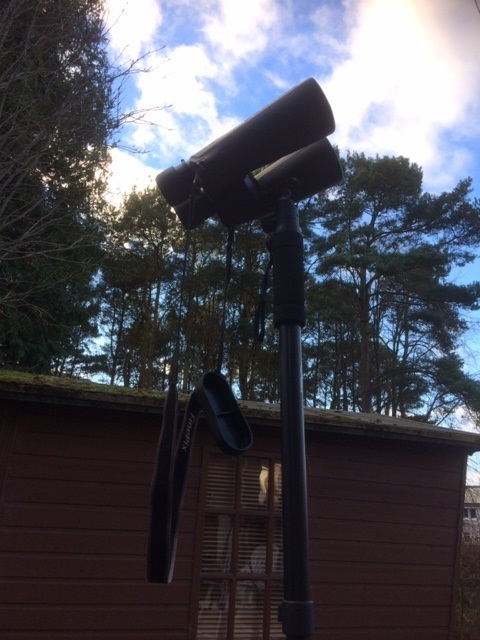 Travelling light; the author’s preferred mode of mounting the Pentax 20 x 6o binocular using a light but strong extendable monopod and ball and socket head. Simplicity itself; the 20 x 60 mounted on a lightweight but sturdy monopod. Using the monopod, I have been able to get very stable views during daylight and extended periods of night use. For quick looks, I usually stand and adjust the angle of either the monopod itself or the ball & socket head. For the most stable viewing sessions however, I relax in a recliner and, securing the monopod base between my feet, have attained nearly jitter-free viewing. I have learned to place some of the weight of the binocular on my face, which increases the overall stability to a significant degree. Yours truly suitably attired, demonstrating the use of the monopod. As the size of binoculars increase, it makes a lot of sense to decide on a porro prism design, rather than its roof prism counterpart. Porros are less expensive and just easier to make well and also offer slightly more light throughput than their roof prism counterparts. The optics of the Pentax PCF WP II 20 x 60 are notable. All lenses are fully multi-coated with a protective overcoat. The Bak-4 prisms are also multi-coated. The oculars are constructed from aspherical lenses which offer several advantages over conventional lens systems, espcially in the suppression of spherical aberration and a number of off-axis aberrations that plague conventional porro binos. In addition, fewer elements are needed with ashperical designs, significantly reducing weight. Rather than rambling on with this, it’s best to hear it from an established optics firm. Here is a link to more information on aspherical lenses. Collimation of binoculars is important especially on these high power units. 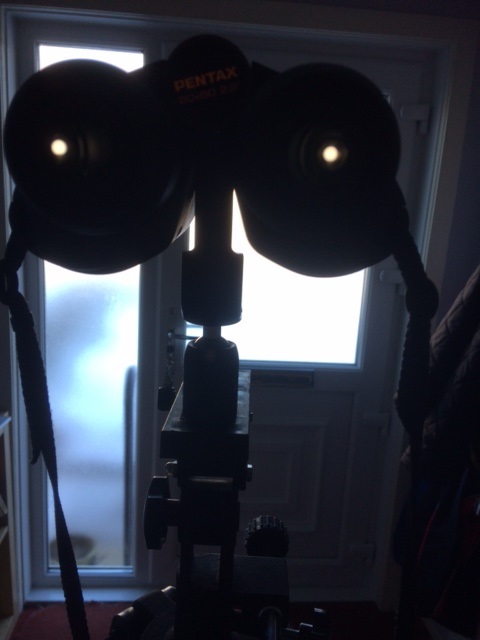 One quick way to test for collimation is to mount the binocular on a tripod and select a target at least a kilometre away. I elected to use the snow capped Fintry Hills a couple of miles distant. With the correct IPD selected for my eyes, I look through the binocular and slowly pull my eyes away until the exit pupils start to become separated and I can only see the top of the field. If there is miscollimation, one image will be raised slightly higher than the other. To my relief both images remained perfectly level. Testing for sideways collimation involves aiming at a distant target and testing to see if images at the edge of the field are precisely aligned on both sides. In doing this, I detected a very slight misplacement but it was so small that I wasn’t worried. The images merge very easily and you don’t encounter eye strain even after prolonged use. Misaligned prisms can also be revealed by examining the shape and size of the exit pupil when the binocular is pointed at a source of light. As you can see below, both exit pupils are round and of the same size indicating that all was well. Two round exit pupils of the same size indicate good alignment of the prisms with no picking off evident. The binocular has a 3mm exit pupil. This ensures the best part of your eye is imaging the field. And oh what a field! When precisely focused images of daytime targets are bright and tack sharp across nearly the entre field (read 95%), indicating that that aspherical optics were working well. Contrast is excellent with very effective baffling of stray light. On axis, very little chromatic aberration could be detected but I could see that off axis some lateral colour was evident. That said, it was very slight and totally acceptable to my eye. In comparison to a side by side test made with my ShortTube 80 f/5 achromatic telescope charged with a power of 16x (5mm exit pupil) in a wider 3.75 degree field showed much higher levels of lateral colour. Spying on a corbie perched on a TV aerial against a bright sky background about 40 yards in the distance showed very slight secondary spectrum around the crow’s jet black plumage. I deemed the result quite excellent and non-intrusive for an achromatic binocular of these specifications. Close focus was estimated to be about 8.5 metres. A Curious Aside: Yep, as soon as an issue is raised here it soon pops up online lol. Check out the consensus in this thread regarding ED elements in binoculars. For nightime testing, I mounted the 20 x 60 on a simple monopod, as described previously. 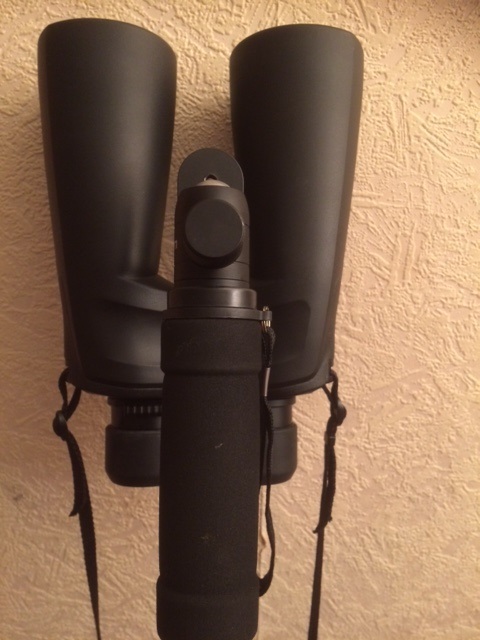 This is a very quick and effective way to get going with this large binocular. Some users of the instrument complained about the small field of view offered by the Pentax PCF, what with its 2.2 degree true field. Others commented on the sensitivity of the instrument to eye placement, but truth be told, I found neither of these things to be in the least bit distracting. You see, I’m used to very small fields working with close double stars at very high magnifications and with fields that are far smaller than what is offered by this big gun. Right off the bat, I was enjoying very comfortable, stable images. A 2.2 degree field is small as 60mm binoculars go, but it is plenty good enough to frame larger deep sky objects. To my mind, it simply boils down to training. My first light target was the Pleiades cluster in Taurus. Getting myself comfortably positioned on my recliner and adjusting the monopod, I was absolutely blown away by the sight of this magnificent open cluster in the 20 x 60! More like an astrophoto more than anything else, the entire cluster was beautifully framed, crammed full of gorgeous blue-white starlight and razor sharp from edge to edge. The sky hinterland was jet black with none of the flaring of stellar images that I had experienced in my brief rendevous with budget 15 x 70 models. It is immediately apparent that the field is very flat from edge to edge, with no distortions that I could register. It just exuded quality! And although I own a number of good telescopes that can collect far more light than this 20 x 60 instrument, they could not beat it in terms of delivering such a magisterial image. Focusing the binocular was particularly satisfying; very small motions can make the difference between seeing the faintest stars and not seeing them at all. Turning next to the Sword Handle in Orion, which is also perfectly framed in the 2.2 degree field, I was deeply impressed at the wonderful contrast and colour rendering of the bright O/B stars in the field; tiny little pinpoints of light bathing my retinas. I could easily make out the greenish hue of the great Nebula in Orion (M42) and a steady hand revealed at least two of the tiny quartet of stars comprising the famous Trapezium (Theta Orionis complex). Though the field of view is not large enough to frame the three bright Orion belt stars, the 20 x 60 pulls out many more faint stars in Collinder 70 that are quite beyond the reach of my regular astro binocular; my trusty 10 x 50. Suddenly, this peterrnaturally lovely open cluster has become a whole lot more crowded! In the wee small hours of freezing January nights, I would watch the sky, waiting for the Beehive Cluster (M44) in Cancer to approach the meridian. Having experienced the Pleiades, I was very much looking forward to seeing this large and sprawling open cluster in the 20 x 60. And again, it did not disappoint; the view was enthralling! The entire field was filled with pinpoint stars against a jet black sky. Using two eyes greatly enhances the view and there is a lot to be said for seeing these wonders of God’s creation in their correct orientation, as if they were made for such instruments. The glories of the Double Cluster in Perseus were a joy to behold in this high power binocular; great mounds of starlight of varying hues with curious fans and spirals of distant suns meandering their way from their crowded centres. Compared with a 10 x 50, the view was simply in a different league! I didn’t notice much in the way of chromatic aberration in the images, save for a brief spell with the Dog Star, Sirius. It’s brilliant light is dazzling in the 20 x 60, corruscating with various colours from moment to moment. In my opinion, secondary spectrum is a complete non-issue with this instrument for astronomical use; just set it up and go stargazing! Although smaller deep sky objects are best examined in telescopes with more light gathering power and their ability to take higher magnifications, I nonetheless enjoyed some very pleasing views of the Auriga trio of Messier open clusters; M36, M38 and especially the sumptuously rich M37, which appears satisfyingly large, well defined and glistening with the light of many faint suns. M35 was also big and prominent in this large binocular with dozens of its constituent stars being easily made out. This is a wonderful instrument for framing and observing the Engagement Ring: a circular arrangement of faint stars encrusted with the creamy bright Polaris as the principal gemstone. Smaller, more conventional binoculars really don’t show this structure half as well, owing to their lower power, wider fields and reduced light grasp. With such a large and powerful binocular, the colours of stars really stand out; marmalade orange Propus, sanguine red Mu Cephei, the soft yellow pastels of Capella and the Orion belt stars, white as the driven snow. This instrument would also make a dedicated variable star observer very happy, what with its impressive light gathering power (reaching down to perhaps + 11 magnitude from a dark site with good transparency) in a very well corrected, wide field. The 20 x 60 might not be the first instrument that comes to mind for a budding comet hunter, but I am reminded of the advice of the great 19th century observer, William F. Denning, who recommended an instrument with a field of view of between 1 and 1.5 degrees for such work. And in more modern times, the distinguished comet discoverer, David H. Levy, advises that the comet-seeking instrument deliver a field of just 0.75 angular degrees! Seen in this light, the suggestion doesn’t seem quite so far fetched. The telescope provides wonderful views of some prominent binocular doubles; Mizar & Alcor, o1 Cygni, Albireo, Mintaka and Cor Caroli, to name but a few. The Pentax PCF 20 x 60 is a formidable instrument for delineating structures within larger asterisms. Just have a look at the stars around fiery red Aldebaran with this bazuka! Sure, you can’t see the entire Hyades but with its pinpoint stars, wonderful contrast and generous ‘space penetrating power’, as Sir William Herschel of old liked to say, it allows you to capture painfully beautiful starfields, rich in light and colour against a velvet black sky. It’s even more amazing when pointed at Alpha Persei; the field is littered with lovely stellar jewels sparkling through the cold dark of interstellar space. This will be a great instrument to begin a study of stellar hinterlands around the brightest stars in general, something I thought about in the past but never pursued because of other diversions. I think it’s tailor made for such projects! Ready to go when you are: the Pentax PCF 20 x 60 can be used at a moment’s notice between heavy showers when some clear spells manifest. Starting in Gemini and running the binocular haphazardly across the sky through Auriga, northern Orion, Taurus, Perseus and ending in the gloriously rich Cassiopeia, the binocular shows me many new asterisms which I had not witnessed before, a consequence of its unique field of view, magnification and image orientation. Almost every field stumbled upon brings new bounties, delicate arrangements of stars unnoticed in smaller binoculars; vast shoals of starlight in the open ocean of space. In the early days of February 2019, I got several opportunities to observe the waxing crescent Moon through the monopod-mounted Pentax PCF 20 x 60 binocular. The views were amazing; razor sharp, beautiful contrast, most excellent suppression of internal reflections that can easily plague lesser binoculars. Indeed, I’ve devised this simple but highly discriminating test as a way to quickly establish whether a binocular is fit for general astronomy use. If the unit shows flare and/or internal reflections when pointed at the Moon, it’s leaking light. The image scale of the Moon seemed larger than I expected it to be in going from a standard 10x binocular to this 20x unit. It just seemed like I was getting a higher power than the 20x marked on the Pentax binocular tube. This is no doubt an illusion, a consequence I suppose of the Moon’s taking up a larger fraction of the area of the field than seen in my trusty 10 x 50 binocular. The earthshine from the dark side of the Moon was very prominent and as the crescent continued to grow, the binocular revealed more and more details of the lunar regolith. The image scale is great for seeing high resolution details of the battered southern Highlands. On the evening of February 10, I enjoyed a wonderful view of the three large craters; Theophilus, Cyrillus and Catharina on the eastern shore of Mare Nectaris. Up north, Atlas and Hercules could be clearly made out with a steady hand. The limb displayed a sliver of colour; sometimes green, sometimes yellow, depending on where my eyes were postioned.I judged the chromatic aberration on this tough target to be minimal and completely non-intrusive to a seasoned telescopic observer. Contrast between the bright lava fields and darker maria was very well presented, producing an extremely immersive, aesthetically pleasing view. 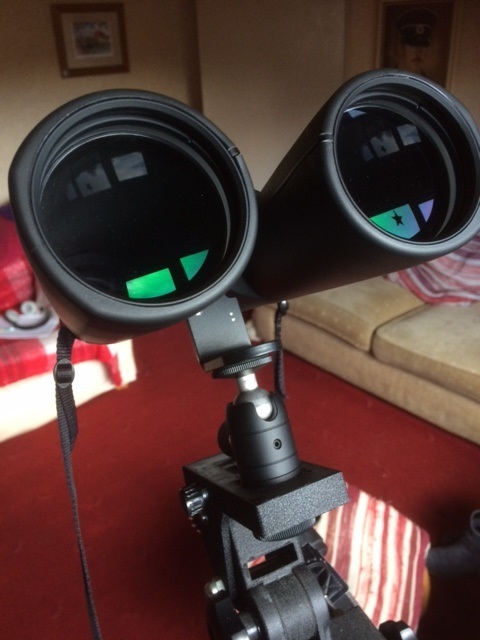 This will be a great binocular to observe the early waxing Moon during March and April, when earthshine is at its most prominent and I look forward to fielding the instrument for this purpose. Sure, the binocular cannot substitute for the telescope proper, but it certainly complements those high-power, high-resolution views. The big binocular has a charm all of its own and should really be enjoyed on its own terms. A quality, large binocular at a great price! As you can probably discern from the above write up, I took to this instrument like a proverbial duck to water! The Pentax PCF 20 x 60 WP II is an impressive performing, large binocular, with a rugged but durable housing. It is water and splash proof, making it suitable for routine and/or prolonged work by day or by night. 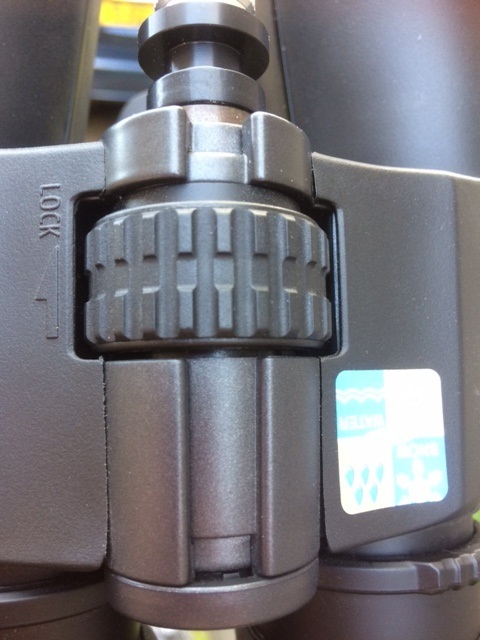 Its high magnification requires a stable mounting system to get the best out of the instrument.The ability to lock the focus in place is a useful mechanical feature that will be greatly appreciated by all those who use it in the field. The Pentax 20 x 60 has very high quality optics, including properly collimated porro prisms and quality multi-layer coatings that efficiently transmit light to the eye. All lenses are also fully multicoated. The aspherical optics deliver a very highly corrected field, from edge to edge. Chromatic aberration is very well controlled and is not intrusive in normal use. Contrast-robbing internal reflections are also very well suppressed in this instrument. The binocular is very easy to use and has comfortable eye relief(21mm with the twist-up eyecups), allowing hassle-free viewing for both non eye-glass wearers and those that like to observe with their glasses on. 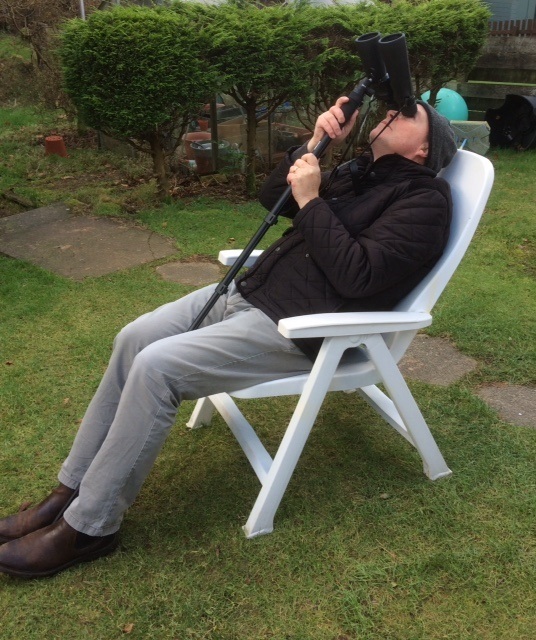 Less experienced observers have complained that the binocular has too small a field, but I am reminded of the superbly designed (but very expensive!) Takahashi Astronomer 22 x 60 binocular which sported a field of view of just 2.1 angular degrees, so slightly smaller than that offered up by the Pentax 20 x 60! In truth, a 2.2 degree true field is perfectly adequate to frame the vast majority of celestial objects. The binocular is ideally suited to framing showpiece deep sky objects for careful study, such as the Double Cluster, the Pleiades, the Beehive Cluster and other large Messier objects, but is also well appointed for use in comet hunting/observing and variable star work. Its high magnification and excellent contrast produces magnificent views of the Moon that will impress anyone who uses it. 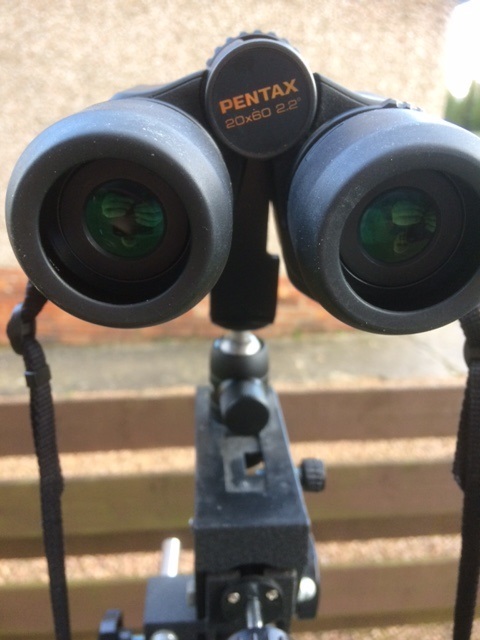 The Pentax PCF 20 x 60 WP II can also be employed as a two-eyed spotting ‘scope in long-distance daylight viewing/surveillance, e.g. observing a bird’s nest at a comfortable distance or in a variety of maritime applications. Its very reasonable retail price makes this a most attractive instrument for budget conscious amateurs who do not want to compromise on optical performance. 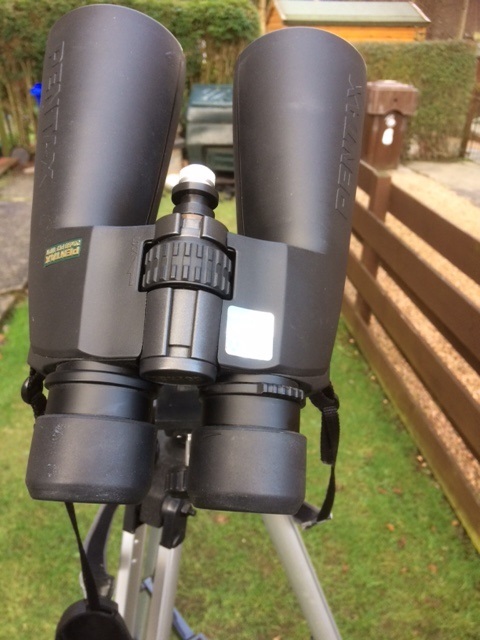 Post Scriptum: Stephen Tonkin, an accomplished binocular astronomer and author has written another review of this binocular (the newer SP incarnation). It can be viewed here. And then another one pops up; coincidence? lol. Neil English is the author of several books on amateur astronomy. His latest work, Chronicling the Golden Age of Astronomy, is now availlable in hardback and electronic formats.